Bring the experience PlayStation on your mobile device with the new PlayStation App! You’re always ready to play with the features that keep you connected to your friends and play games that you like. Send games from PlayStation ® Store to your system PS4 and prepare to play at home. PlayStation App for those who still had not discovered, is the companion app to use with the PlayStation 4 made ​​by Sony for devices Android . By signing in with your PSN account , it is possible to perform a number of tasks such as chatting with their friends on the network PlayStation, display trophies , see Ustream and even buy games that will be installed automatically on our console. · See what your friends are playing, compare trophies and see your profile or recent activity. 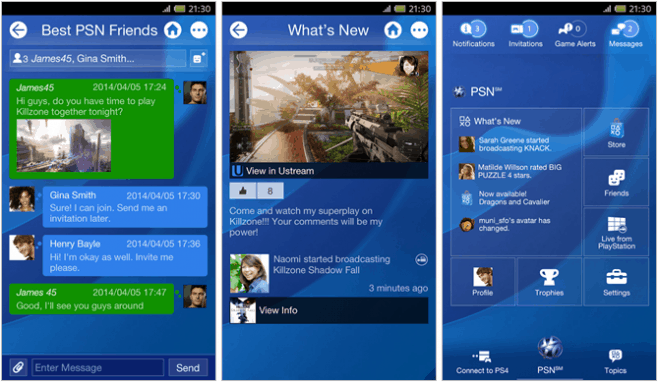 · Chat with your friends, receive notifications, alerts and invitations to play and use the mobile device as an on-screen keyboard for your system PS4 . · Exploring the PlayStation ® Store, choose the latest games and additional content more successful and send them to your system PS4 to find them ready when you get home. · Take advantage of the second screen of functions integrated in the application, when available, for the most exciting challenges and greater control. · Quickly access to guides and manuals for the system and PlayStation PlayStation.Blog. To use all the functions of this application requires a Sony Entertainment Network account and a PS4 system. I’ll talk again because the Japanese giant has updated the application in these last hours, adding some features that gl users may find it quite useful. Meanwhile Improved general stability in the use of certain functions. In addition, PlayStation App now supports push notifications for the various requests that come to us, which means that we do not lose any more invitation for any match in multiplayer. Also added the ability to set the photographs taken by smartphones and tablets as profile picture and sending requests to PSN friends via email or SMS . Please note, finally, that the PlayStation App is completely free of charge.